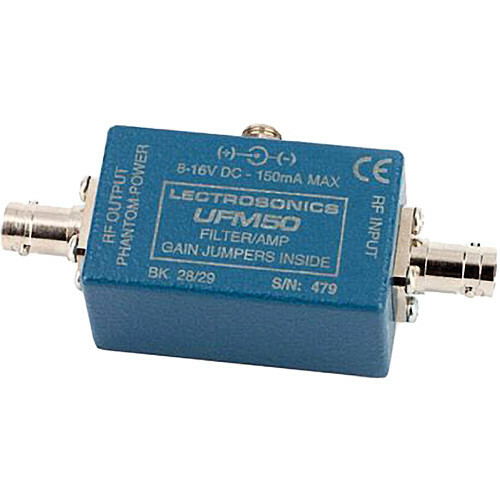 The Lectrosonics UHF Filter/Amplifier Module (Block 19-20) provides a unique, high performance solution for antenna systems requiring long cable runs or distribution to multiple receivers or locations. The unit can be used to apply RF gain at the antenna ahead of a long run of coaxial cable to compensate for signal loss through the cable. A compact, high performance multicoupler can also be configured using the UFM50 ahead of an RF splitter to offset the loss through the splitter. The UFM50 design places RF filtering before gain to minimize intermodulation (IM) products and prevent overload. Two transmission line ceramic resonators at the input provide filtering with a 50 MHz bandwidth. Following the filters, 12dB of gain is applied with a high quality GasFET RF amplifier with an excellent +41dBm IP3. The result is outstanding RF performance without IM or overload problems. A switching regulator is used in the power supply to control current consumption over an input voltage range of 8-16 volts. The regulator maintains low current consumption and low heat dissipation which is especially useful in portable audio mixing common in field production and ENG. The UFM50 can be powered from external DC or via phantom power through a coaxial cable connected to a multicoupler. The housing is constructed of cast aluminum with a brushed aluminum cover plate. Two rugged BNC connectors and a threaded, locking power jack provide secure connections for rugged field conditions and for long-term installations.